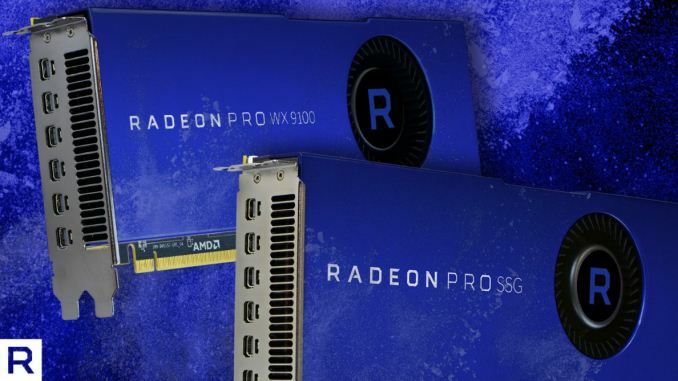 Last week, AMD quietly announced the availability of the Radeon Pro WX 9100 and Radeon Pro Solid State Graphics (SSG), the former card shipping now and the latter shipping soon. Alongside the cards are two new Radeon Pro Software drivers for Pro WX 9100, Pro SSG, and Radeon Vega Frontier Edition. The major driver, Radeon Pro Software Crimson ReLive Edition 17.10, is actually the same Vega Pro driver previewed and announced earlier this summer, now bringing full Driver Options and more to the WX 9100 and Vega Frontier Edition. The other driver, 17.10.1, is the inaugural driver for the Radeon Pro SSG (Vega), and it is not clear if it includes 17.10’s new features. Update (10/26/17): A few hours after the publication of this article, AMD released Radeon Pro Software Enterprise Driver 17.Q4, a unified driver update that includes support for the WX 9100, SSG, and Vega Frontier Edition. This release is now the latest driver for all three, and at this time, their workstation driver download links lead to 17.Q4. AMD later confirmed that Vega SSGs began shipping during the week of 10/16. Prosumers and close readers may remember AMD’s SIGGRAPH 2017 Capsaicin event, and at the time they slated the WX 9100 and SSG for release on September 13th, at $2199 MSRP and $6999 MSRP respectively. While it is late, the products are finally available at HPC/professional outlets and traditional retailers. SabrePC is offering the Pro WX 9100 at $1549 and Pro SSG at $4599, in-line with SEP prices, while Newegg has the Pro WX 9100 at $1599 and the Pro SSG, due for release on October 31st, at $6999. As a note of clarification, lowered prices from retailers reflect the Suggested Etail Price (SEP), which is seen in multiple professional products from both vendors; MSRP reflects the cost if purchased through a brick-and-mortar distribution model. To be clear, the WX 9100 has already started shipping late in Q3, as noted in AMD's Q3 2017 earnings call; as for the SSG, it appears to be shipping before the end of the month, with SabrePC citing stock but a 3 - 5 day period before shipping availability, as well as Newegg's October 31st release date. For the WX 9100, this slots in at the top of the AMD workstation video card stack, joining the Polaris based cards announced last year, as well as the entry-level Polaris 12 based cards, first introduced as the RX 550. For the SSG (Vega), this release has finally productized the prototype SSG, although swapping Fiji out for Vega. With 2TB M.2 NVMe SSG + 16GB ECC High Bandwidth Cache (HBC) of total video memory, the Radeon Pro SSG allows for significantly larger workset sizes. 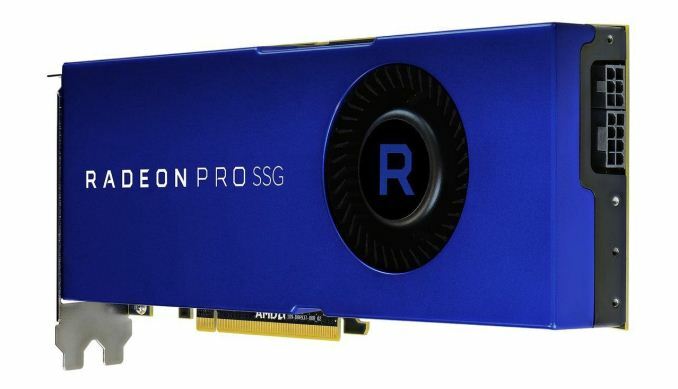 As opposed to the beta SSG, the Radeon Pro SSG is now able to coordinate the video memory with Vega’s HBCC, a feature that was not present in Fiji. In terms of drivers, 17.10 brings full functionality of “Driver Options,” although limited to Windows 10. Essentially, Driver Options allows Radeon Pro Software to swap between up to two gaming drivers (Radeon Software for Radeon Pro) and one professional driver (Radeon Pro Software) without a reboot. The installation process requires the Custom Install option to be selected, and AMD has provided a user guide outlining the setup of Driver Options. Alongside the driver, AMD had also released updates to the Radeon ProRender plug-ins, centered around performance and new features. 17.10 also fixes 10-bit display anomalies in display results and Blu-ray playback issues on PowerDVD after switching to Game Mode, as well as infrequent hangs during wake from sleep or resume states, and TDRs during sleep and resume when instant replay is enabled. As for 17.10.1, the Radeon Pro SSG launch driver is only available for Windows 10 (64 bit), with an SSG API User Manual available online. Both drivers state that the WX 9100 and SSG do not support Multi-GPU Large Surface, AMD CrossFire Pro, Display Overlap, and Serial Digital Interface. Additionally, the WX 9100 does not support Pack Pixel with 10-bit support, and the SSG does not support Bus Active Chip Off. For more driver details, see the 17.10 and 17.10.1 release notes, as well as AMD’s workstation graphics driver index. The SSG is completely unnecessarily, it's an act of desperation, shooting in the dark, hoping to hit something meaningful. 4 TBs of storage would hold like 12 minutes of 8k footage - woot! Now if you are going to be streaming and buffering over the PCIE bus, you might as well do it directly, without strapping hot running SSDs on a hot running GPU. And save 5-6k $$$ while you are at it. The real-world gain is very close to zero unfortunately. Having the GPU on a x16 slot means you can push 16 GB/s, some basic data streaming and buffering and you can keep the GPU well fed 100% of the time, at the negligible penalty of a single buffer fill. Which means you can plug some more adequate storage to it, like say an array of 16 HDDs, which will give you both the bandwidth as well as the storage required for high resolution video. But even if it is something less demanding than 8k video, this product is pointless. The SSD cache is pointless, it is not what makes it work. Which is why nvidia was able to make an identical demo without having SSDs on graphics cards. Your system can either meet the bandwidth requirement, in which the caching is pointless, or it cannot, in which case the cache gives you 10 minutes of footage after preloading and then it is back to stuttering. All it really takes is streaming to a double buffer, sized according to the computational throughput, the double buffering will hide the extra latency completely save for the initial buffer filling, which is like milliseconds. So now it all boils down to the question, is shaving off a few milliseconds off your render job spending an additional 7500$? I don't think so, because in such scenarios you are always computationally bottlenecked, and spending that 7500$ on moar GPUs will give you actual and significant performance improvements. Sounds? How exactly? NAND is so slow that it literally makes no difference whether it is on the GPU or on the PCIE bus. If anything, the SSG solution introduces an additional step in the pipeline, and one that is subject to rather fast wear at that. Keep in mind that those are standard PCIE NVME drives, they do not somehow magically connect to the very GPU core, it is still using a PCIE bus, and it still comes with the overheads of NAND, NVME and PCIE, and any notions of direct addressing are emulated. They don't get magically full of data either, it still has to arrive from somewhere. But imagine how stupid will it look when nvidia graphics turn out to be capable of the same feats without integrating SSDs, for both AMD and the chumps that will get duped into buying this. Wow, you really don't get it.